Failure rate. All of the questions asked above can be answered in two words, failure rate. Although ABIT, AOpen, Supermicro, Tyan, and all the big names in the motherboard industry do make some great motherboards, for a small store to stock their motherboards is pretty much out of the question. Why? Because their failure rate is simply too high. For the most part you've probably had great experiences with the above manufacturers, however as a company grows some of its original concerns and policies are overshadowed by the consequences of success. While a manufacturer may have started out by producing high quality motherboards at a slow but steady pace, success has the potential to corrupt that by demanding higher rates of production even if quality is a sacrifice. If you're looking for an extremely reliable motherboard to use in your custom built systems with a low failure rate, your first priority will not be speed, rather quality, which is where QDI comes in. 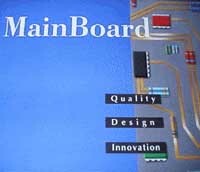 Judging by their TX based AT Socket-7 motherboard, the Titanium 1B, QDI seems to have a solid head on their shoulders. Talking to any one of a number of vendors that carry QDI boards they seem to collectively agree that the failure rate on QDI motherboards is next to nothing. Why is this? Well, QDI has nothing to prove, they aren't trying to be the best in the world, they aren't trying to produce the most motherboards at the greatest profit, nor are they trying to compete with the rest of the industry in releasing motherboards based on the latest yet unproven chipsets. QDI has one goal in mind, doing what they do, to the best of their ability...that is making motherboards. With a company like that, as long as they have the marketing know-how and the engineering skill of the rest of the crowd, you can't go wrong. Part of QDI's Socket-7 flagship series, the Titanium 1B proves this without hesitation. The Titanium 1B makes very little use of tantalum capacitors, while QDI did opt to make sparing use of a few electrolytic capacitors around the Socket-7 IC and the Switching Voltage regulators. The AT form factor of the Titanium 1B is packed full of just about everything, the motherboard can easily fit in the most compact of spaces, although for cooling purposes I would recommend using at least a Mid-Tower case with the Titanium. The 4 PCI and 3 ISA slots are pretty much standard, and can cover the needs of most users, as the Titanium 1B is targeted towards the average user market. Completing the square with 4 SIMM and 2 DIMM slots and both AT and ATX power supply connectors completely fill the AT style motherboard. While the Titanium 1B is a very stable motherboard, missing from the switching voltage regulator units are the heatsinks that are so very common on motherboards these days. Apparently QDI saw no reason to include them, therefore reducing the overall cost of the motherboard, however this could pose a long term reliability problem in the future. 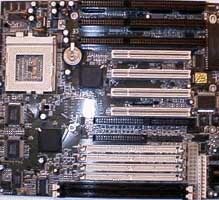 Another reason QDI's motherboards are very popular among normal everyday users is that they are jumperless. Their SpeedEasy Jumperless CPU Setup closely resembles ABIT's SoftMenuTM Jumperless Setup, actually there is some dispute as to which of the two was the first to introduce a Jumperless CPU Setup. Regardless of whether or not they were first, the SpeedEasy Setup allows the user to select from a list of pre-defined settings for CPU's and also allows the user to manually set the Clock Multiplier/Bus Speed...makes overclocking a breeze. With the standard QDI Titanium 1B BIOS you can only choose from a list of bus speeds ranging from 50MHz to 75MHz, however by requesting it from QDI you can obtain a BIOS upgrade, albeit a beta version, which enables the 83.3MHz bus speed setting. QDI's manual states that the Switching Voltage Regulator supports voltages from 2.0v to 3.5v, however in order to achieve some of those voltage settings (i.e. 2.2v for the K6/266) you'll probably have to contact QDI for a BIOS upgrade. An ATX form factor would've been nice with the Titanium 1B, however all you AT fans out there will be happy with the motherboard. A bit of a disappointment are the 3 ISA slots than simply can't accept full length cards, you may be able to stick a full length card in the first and second ISA slots, however the third ISA slot is completely blocked by the Socket-7 Heatsink/Fan. The user's manual packaged with the Titanium 1B is a long way from being nearly as comprehensive as some of the classic ABIT or AOpen manuals, however since the motherboard is geared towards users who aren't really interested in the information contained in those manuals it is ok.